Clean and condition pads to extend their life! 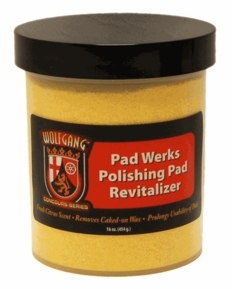 The Wolfgang Pad Werks Pad Care Combo is all about maximizing the polishing experience by cleaning and conditioning your pads after every use. Wolfgang Pad Werks Polishing Pad Cleaner used in conjunction with the Foam Pad Conditioning Brush releases caked on polish and wax residue from all pads, leaving them clean and ready for future polishing sessions. 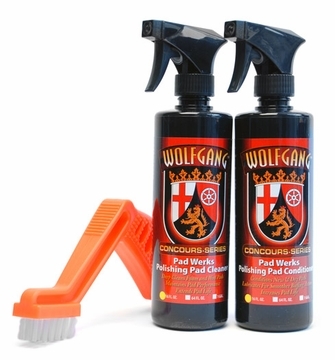 Wolfgang Pad Werks Polishing Pad Conditioner reduces buffer hop and fatigue by conditioning new or fresh pads for a smoother buffing experience. Get the most out of your buffing pad collection with this money-saving combo! This handy orange brush is made with a set of stiff bristles that easily pull caked and dried products out of the foam pad. And the specially shaped handle makes it comfortable to grip and keeps your hand away from the spinning buffer. When you’re finished with your buffing pads for the day, saturate them with Wolfgang Pad Werks Polishing Pad Cleaner and use the Foam Pad Conditioning Brush to break up and release caked on polish and wax residue.